For a cyclist, the perfect cup of tea comes in one of these stylish mugs, with a hand-drawn art style which really captures the intricate structure of the bicycle. Made from fine bone china, and featuring detailing such as a pattern of gears around the inside of the mug, it really is something a little special. You can make it an even more thoughtful gift by filling it with fancy tea bags, fresh coffee or any other beverage that will bring a smile to the recipient’s face. This Velo keychain has a unique and eye-catching design, making it a great choice when you’re looking for something a little bit different to put in a cyclist’s stocking this year. Affordable but high quality, made from metal alloy rather than plastic, it’s a great cycling gift option that won’t break the bank. Is your cycling buddy more interested in the classic bicycles of times gone by than the latest model? If their cycling interests surround the history of great bike design, then they’ll love the Adler 1902 kit – a D.I.Y model bike kit that will let them put together one of the best-loved cycles of the early 20th century. There are a range of other great models out there, but we love the Adler because the plain pieces allow this bike to be painted it up in whatever colours the recipient desires, making it a fun and personal gift. Just remember to give them some paint, too! 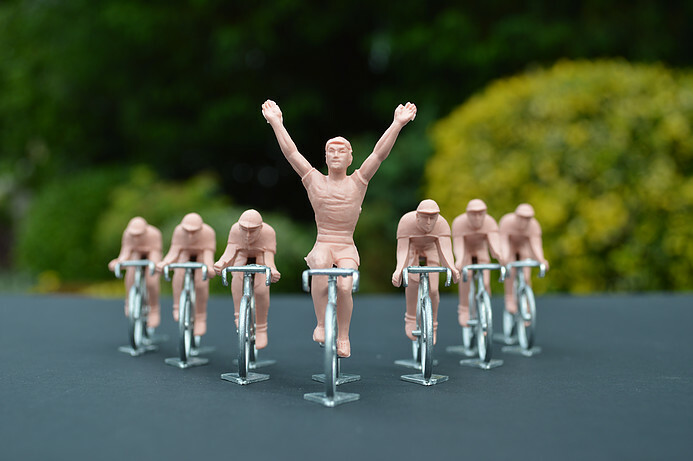 If you’re buying a gift for somebody who is already a keen collector of cycling memorabilia, one of the renowned peloton rider models might be a good option, as it will fit right in on their display. You can choose a model that they don’t already have or, if they haven’t started collecting Peloton riders yet, why not treat them to this set of seven featuring a range of different poses? Of all the different cycling art out there, Joseph Warren’s Velodrome Gears Print is definitely one of the most unusual pieces that we’ve seen, and that’s why it simply had to make the list. The design itself is incredible, drawing the eye in with excellent typographic detailing as well as gorgeous colours and shapes. However, what really sets it apart is the fact that it also functions as a gear ratio calculator (used by cyclists to work out the best combination for their bike). This practical use definitely elevates it as a cycling gift – and with just 30 signed prints available as part of a limited run, it’s also an exclusive Christmas present that certainly won’t be under every cyclist’s tree this year. Choose your favourite family snap – or perhaps a picture of the cyclist that you’re giving the gift to out on the road – and put it inside the stylish Triple Bikes photo frame for a cycling themed gift that can be proudly displayed on the mantelpiece or elsewhere in the home. Of course, the photo that you include doesn’t have to be cycling themed, but so much the better if it is, since this will tie the present together! A picture of your loved one crossing the finished line on their bike is always a great choice or, if there’s a youngster in the family, why not get a pic of them on their first bike. Jewellery and cufflinks featuring subtle cycling motifs are a great Christmas gift since they can help cycling lovers add a splash of personality to their outfit on a special occasion… or be worn each and every day. It’s also a very personal gift, which shows that you have thought long and hard about the tastes of your cyclist friend or relative to find an item that they’ll love to wear. A bespoke model bike can be painted up to match your specifications, and delivered already assembled and ready to be put on display. These models use the high-quality N+1 cycling model parts, with working brake cables and moving pedals, making them a very popular Christmas gift. Now for something a little bit different… for anybody who loves the quirkier side of life, a model of the Un Gelato a la Bicicleta is a fun cycling gift. These are models of the Mediterranean ice cream bikes which offer ice cold soft scoop on the go. With bright colours and a light-hearted feel, they’re a very vibrant present to unwrap on Christmas morning. Are you looking for a gift to give to a real winner? It’s never a bad time to show someone how important you think they are, but Christmas is the perfect occasion to give a gift that says it all. From the Olympic gold styled bike model to the Champion Peloton Rider, why not give something that celebrates cycling success? So there you have it: the Targetvelo Christmas list, designed to give you an insight into what cyclists like us might like to see in their stockings or under the tree this year. Good luck finding the perfect present for your cycling obsessed friend, relative or partner.